An NBC News analysis of FEC filings and social media shows GOP groups, foreign countries and federal agencies have spent big at the luxury hotel. WASHINGTON — The Trump International Hotel, five blocks from the White House, is a welcoming place for Trump administration officials and their supporters — and an ongoing legal headache for the president. The Trump Organization spent $200 million transforming the Old Post Office into a five-star hotel that harkens back to the Gilded Age. It opened right before President Donald Trump's upset victory in the 2016 election, and soon became a magnet for Trump backers, and for other customers whose patronage was more problematic. Eighteen months into the Trump presidency, an NBC News analysis of public filings and social media indicates substantial spending at the hotel by federal agencies, Trump's political allies and foreign governments. Trump supporters enjoy coming to the bar and cavernous lobby to see and be seen, and for them it's not a bad thing if a member of the administration or the Trump family happens to be there to notice they are patronizing the hotel. Is DC's Trump International hotel a conflict of interest for the president? "Who doesn't want to come and have a chance to see the vice president, the secretary of the treasury, Kellyanne Conway or even the president himself?" asked Nicole DiCocco, a Trump loyalist and a member of a Palm Beach-based group that calls itself the Trumpettes. DiCocco has photographs of herself at the hotel with Vice President Mike Pence, Rudolph Giuliani, Sarah Palin, Larry Kudlow and such Trumpworld stars as Diamond and Silk, Eric Bolling and ex-aide Corey Lewandowski, among others. It's another group of people who may want to be noticed by Team Trump, however, who are at the heart of the hotel's current legal worries. Soon after Trump took office, the governments of Azerbaijan, Bahrain and Kuwait held official events at the hotel. And three days after his inauguration, the president was hit with his first lawsuit over that kind of lucrative booking. The plaintiffs say the hotel is not just a conflict of interest, but a violation of the Constitution, which includes emoluments clauses designed to keep officials from profiting from their positions or being influenced by gifts or benefits from foreign powers. According to Trump's financial disclosure forms, he took in more than $40 million in revenues from the hotel in 2017. Ivanka Trump's financial disclosure forms show she took in $3.9 million in revenues from the hotel. The Trump Organization is a private company so the hotel's vacancy rates and details on who spent what there are not available. An NBC News analysis of everything from Federal Election Commission filings to Twitter, however, indicates that foreign governments, Republican Party organizations and federal government agencies have all spent significant sums at the hotel since the president took office. The largest sums may have come from the president's domestic political allies. An NBC News analysis of Federal Election Commission filings found that PACs and Republican campaigns have spent more than a million dollars at the hotel. Religious groups and lobbyists for the petroleum and banking industries have held events there, as has the Turkish American Business Council, but it's unclear how much each group spends. That foreign governments have spent money at the hotel, whether it's the Kuwait embassy's party in the grand ballroom or Saudi Arabia footing the bill for hotel rooms for veterans recruited to lobby on its behalf, is well documented. A review of social media found dignitaries from around the world photographed at the hotel, including from Jordan, Malaysia, and Lebanon, and even the Russian ambassador to the U.S.
After sending FOIA requests to more than 70 government agencies NBC News found that almost $56,000 taxpayer dollars have been spent at the hotel, more than $29,000 of which were spent by the Department of Defense. 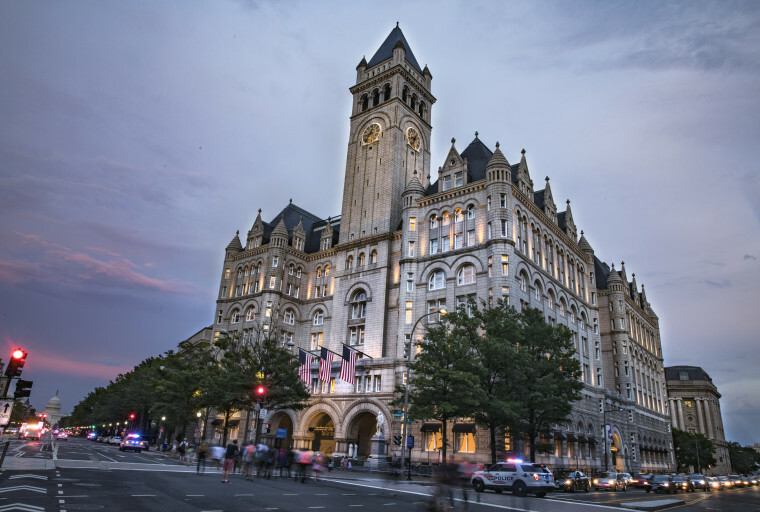 Almost $12,000 was spent by the Department of Agriculture, more than $9,000 by the Internal Revenue Service, and more than $1,700 was spent by the General Services Administration (GSA), which oversees the lease with the Trump Organization. Critics called on the GSA to revoke the lease but that never happened and the agency declined to be interviewed on the record for this story. Former GSA officials who asked not to be named told NBC News that the Trump Organization had won the bid to the turn the Old Post Office into a hotel before Trump launched his campaign, and that he won the bid simply because it was the best deal for the government. Sen. Richard Blumenthal of Connecticut and 200 other congressional Democrats filed suit against the president in June 2017 for allegedly violating the emoluments clause by receiving payments at the hotel from foreign governments. Trump ordered the Trump Organization to donate all relevant profits from his properties around the world to the U.S. Treasury. In February the Trump Organization gave the Treasury $151,470. Blumenthal called the donation a "sham" and "pathetically inaccurate and inadequate." The Trump Organization gave NBC News a letter it had written to Blumenthal in April, explaining the calculation of the $151,470 and saying the amount of calculated profit from wholly-owned properties overstates the actual profits from foreign governments. "Moreover, if the Trump Organization has been unable, after considerable effort, to identify other foreign government patronage revenue," the letter said, "that revenue could not possibly serve to curry favor with or otherwise influence the President of the Administration." The Justice Department has filed a motion to dismiss Blumenthal's suit and both parties are awaiting a judge's decision. The Justice Department declined to comment. This July, a different federal judge supported plaintiffs who filed suit in March against the president for violating both the domestic and foreign emoluments clauses. Attorneys General Brian Frosh of Maryland and Karl Racine of the District of Columbia were granted standing in March and the hotel is the focus of the suit. They argue that patrons' desire to curry favor with the president gives it unfair advantage over competing businesses in Washington and Maryland. Racine calls the president "flagrant, brazen, and dismissive of over 225 years of the United States Constitution" for allowing his company to operate a hotel five blocks from the White House. "We need to know if the president of the United States puts our interest first, doesn't put his bottom line first," said Frosh. The first suit brought against the president that named the hotel as a conflict of interest, filed by the watchdog group Citizens for Responsibility and Ethics in Washington days after his inauguration, was dismissed for lack of standing. CREW has appealed that ruling. Meanwhile, the hotel continues to serve as a clubhouse for the administration and its supporters. Brad Parscale, who is running Trump's 2020 campaign, stays there when he's in town, and holds court with other insiders like former campaign spokeswoman Katrina Pierson. Lewandowski and former Press Secretary Sean Spicer both held their book parties at the hotel. Ivanka Trump and Jared Kushner dined with Kushner's parents at the hotel's restaurant, and Eric Trump and Donald Trump Jr. stop by when they are in Washington. The biggest star has also been spotted on the premises. Trump, who rarely patronizes any establishments in Washington, has dined at the hotel on at least three occasions while in office. For supporters like DiCocco, that's enough to keep it exciting and keep her showing up. "If you watch 'House of Cards,' power is a lot like real estate," she said. "It's location, location, location. And the closer you are to the source, the more power you have. So I think D.C. being a power culture, everyone wants to be in and around the Trump hotel." Kenzi Abou-Sabe, Lisa Cavazuti, Courtney McGee, Vaughn Hillyard, Merritt Enright and Ali Vitali contributed.